On the occasion of its fiftieth anniversary (2008), the NFI published a booklet recounting the most significant moments of its history, of the evolution of its methods, and of its way of carrying out the French forest inventory. The working group in charge of forestry for the third modernisation and equipment national plan noted the lack of reliable data to define a forestry policy. It acknowledged the necessity of a national forest inventory. The presidential Ordinance Nr 58-880 added to the Forestry Code two new articles (204.1 and 204.2 transformed later in L. 521-1 and L. 521-2). The first article states that the administrative authority will carry out a permanent inventory of national forest resources independently of land ownership. The second article made applicable to the undertaking of this inventory the provision of the laws of July 6th 1943 and March 28th 1957 pertaining to the execution of cadastral and geodesic works. The French National Forest Inventory was gradually established within the Ministry in charge of agriculture, first as a unit of the Forestry Office. It was later transferred to the Department of Rural Planning and Development and Forests (DERF), substituted in 2003 by the Rural Affairs and Forest General Department (DGFAR). In 1981, the first large-scale maps (1/25,000 - 1/50,000 cm) were drawn up. The objective was firstly to prepare a synthetic map for each county: They are used as an intermediate document between the aerial photographs and the published map. The cartographic method started in 1986. A digital map is drawn at a scale of 1/25,000. Three layers of data can be superposed: forest regions, ownership types, forest formation types. The ministerial decree Nr 93-1046 transformed the NFI department into a state administration in its own right, denominated National Forest Inventory. NFI has a map available for every part of the entire French territory. Since November 2004, the inventory has used a systematic survey covering all of mainland France. The sample points on a grid covering the whole territory are divided into 2 x 5 subsets, one of which is treated each year. Using a protocol, field agents return again to the sub-set of plots surveyed 5 years ago and then comparative results are available to illustrate the forest evolutions or to calculate the amount of wood taken from the forest between the two visits. Merger between the NFI and NGI (National Institute of geographic and forest information). 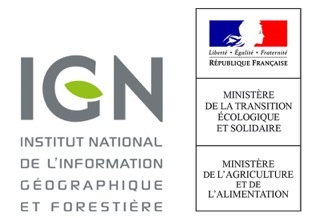 The research Laboratory of forest inventory (LIF) is created in Nancy, to foster NGI capacities of development and analysis of forest information at regional, national and international scales. The national forest inventory got the CNIS (National committee of the statistical information) certification label. The NFI is the only organization giving information about quantity and quality of the wood in the French forests, independently of the notion of forest property, on the whole metropolitan territory. The NFI is of general interest and needed to be registered as a public statistical survey.